/ Home / Press office / How do children view military life? Plymouth University researchers will be asking children from Forces families to share their experiences of what life is really like as a military child. 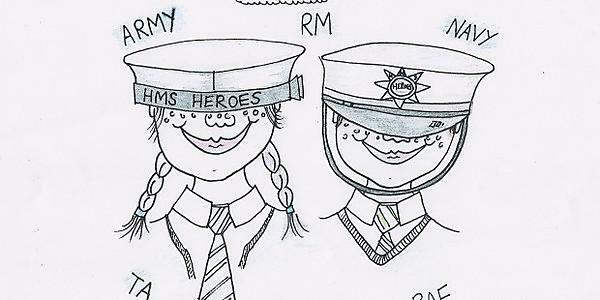 The national pupil voice group for Service children and young people, Her Majesty's School Heroes (HMS Heroes) will be working with the University to gather the information, to identify if families feel supported enough in their local communities. Academics from the School of Geography, Earth and Environmental Sciences will be running focus groups, interviews and art-based exercises with the children and their relatives. The year long study will also include interviews with family support advisors in schools with high numbers of pupils from military backgrounds. "There is not enough data on the lives of British military families, the majority of existing research being drawn from the USA. Our study will be focusing on the practice of mobilising military personnel and their families, and the impacts of these moves on children in particular. We will assess the existing support for military children, how they engage with it and suggest areas for improvement." HMS Heroes, founded in Plymouth, is a national initiative that supports in- school clubs and community groups where children of Service men and women and their relatives can meet, especially in times of need. It has been recognised by a number of Service charities and Members of Parliament and is open to schools and settings around the world from Scotland to the Falkland Islands. "This self-help group is often a life-line to children and families who can be uprooted from their familiar surroundings at short-notice, or for those who have a permanent base, in coming to terms with a close family member going away for months at a time." "This study is unique because it gives children the opportunity to have their say about what it is really like to be in a military family, rather than just relying on data collected from adults. The study is designed so that children's voices will be at the forefront when we present the findings." We are keen to hear what life is really like for military children.